I’ve always thought that restaurant names are superfluous and meaningless. Half the people I know go to Shake Shack and get everything on the menu but the shakes. Others go to restaurants so famous for their Mexican food they’re named after one of their dishes and order Chinese food instead. But my point of view was altered slightly on a rainy day when, ironically, with a stroke of serendipity, I found Serendipity 3. It was my best friend’s birthday and because of the heavy rain we weren’t able to make it to the other side of town, to the restaurant we had originally intended to go to. Instead, we took our chances and looked for some places to eat around the 60th street Roosevelt Island tram station. After almost half an hour of getting drenched in the downpour while trying to salvage our friends birthday celebration, we made the fortunate discovery that was Serendipity 3. Serendipity 3 is typically recognized by the lengthy lines of people queuing up outside to get a taste of its delicious food. Even on rainy days like the one when I first went there, a crowd of people had gathered together in the packed entrance, determined to get a table at the establishment. The restaurant is well known and loved by tourists, resident New Yorkers and celebrities, from both the past and present such as Marilyn Monroe, First Lady Jackie O, starlet couple Jay-Z and Beyoncé, country and pop singer Taylor Swift, as well as actors such as Vanessa Hudgens, Ashley Tisdale and Zac Efron. It has also garnered fame from being featured in several films and television shows, such as the 2001 film of the same name as well as in the CW Television Network Show Gossip Girl. The dishes at Serendipity 3 are not only appetizing and visually appealing, but some of the dishes are also quite humorously named. Soups like Chicken Not So Little and the Caffe Vespucius are among some of the most popular dishes. But typically customers flock to the traditional and classic Frrrozen Hot Chocolate and the Forbidden Broadway Sundae. The restaurant is also widely known for its Golden Opulence Sundae, which according to Guinness World Records was the world’s most expensive dessert, composed of mouthwatering ingredients such as 5 scoops of Tahitian vanilla bean ice cream, the most expensive chocolate in the world, Amedei Porcelana and Malagasy vanilla covered in a 23K edible gold leaf, and the current record holder the Frrrozen Haute Chocolate which is made from a mixture of 28 of the world’s finest cocoas. 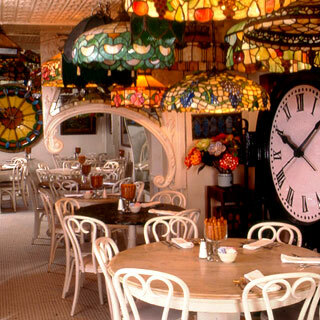 Serendipity 3 is the perfect place to go for a meal at any time of the day. It’s social, quaint, and has food so good you’ll feel as if you’re doing your body a treat by gorging down those calorie filled dishes. Just make sure that you make a reservation in advance, so as to avoid a long wait. Serendipity 3 is open Sunday through Thursday from 11:30 am to midnight, Fridays from 11:30 am to 1 am and Saturdays from 11:30 am to 2 am.